Trinidad Agosto (B.A. ’14) enjoying an afternoon of fellowship near Casa Maria. The numbers are stark: The 313 Marianist brothers and priests in the United States have an average age of 74, and only about 25 of them are under age 50. About 20 die each year, and in the last decade, only five have taken final vows to become brothers. Looking at the numbers, one might think the Society of Mary is fighting for its life. So when two recent St. Mary’s University graduates, Justin Quiroz (B.A. ’13) and Trinidad Agosto (B.A. ’14), decided to undertake the lengthy process of becoming Marianists, one might also think the odds are stacked against them. In truth, Quiroz and Agosto aren’t worried about the statistics. They are more concerned about taking things one day a time. Agosto, who lives in the Casa Maria community on the St. Mary’s campus, is a Marianist aspirant, which is the first stage to brotherhood in the Society of Mary. He is the only one in the nation. All aspirants, once accepted into the Society of Mary’s formation program, live at Casa Maria for a year to see if they fit in. In this trial stage, aspirants attend Mass, prayer and outings with brothers, interacting with them and discovering if the Marianist lifestyle is a fit. For Agosto, the journey to Casa Maria — let alone St. Mary’s — was improbable. However, at 18 years old, Agosto started singing for fun with his then-girlfriend. After realizing he possessed a booming voice, his girlfriend encouraged him to seriously consider studying music. Majoring in vocal performance, Agosto took his mom’s advice of “putting your entire being into whatever you do” and ran with it, graduating on time. Regretfully, Agosto also took that advice for his social life. It was the summer before his senior year, when he was in Ohio working an acting gig, that emotional turmoil got to him. “I couldn’t sleep one night because so many thoughts were racing through my head and stressing me out that I started crying,” he said. “I was never too religious before, but I prayed and prayed. Suddenly, I felt a cooling sensation from the top of my head to my toes pass through my body. Agosto said his brush with divinity — the most powerful sensation he ever experienced — affirmed his belief in God. When he got back to St. Mary’s, he was inspired to take action to re-create that feeling. 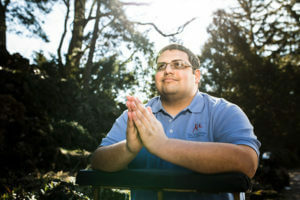 Before his last spring break as an undergraduate, which Agosto called the busiest week of his life, he participated in an event where he lived at Casa Maria to get a feel for Marianist way of life. He also learned about their history and asked questions about his faith. “As busy and tired as I was, I had never been happier every day in a row,” he said. but after that week, he was ready to enter one. Justin Quiroz (B.A. ’13) is a Marianist novice living in Dayton, Ohio. Quiroz, a Marianist novice living at the University of Dayton in Ohio, is one of four men in the two-year novitiate stage — the second step to becoming a professed brother. In this phase, novices receive intensive instruction about their institution and the process of becoming a Marianist. In many ways, Quiroz, a Houston native, was prepped for his religious journey before setting foot on the St. Mary’s campus. 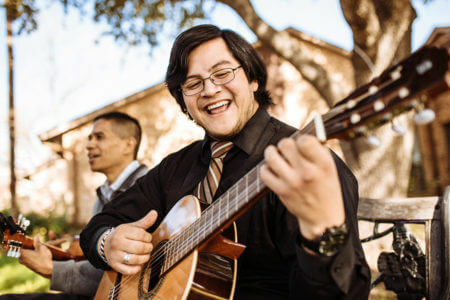 While his older brother attended St. Edward’s University in Austin, Quiroz, like Agosto, went to the Internet for help. Sleeping Bag Weekend on campus was all Quiroz needed to fall in love. “Throughout my sophomore year I was discerning another religious order, but it was during that year of being in the Marianist Leadership Program that Brother Mark Motz, who was an aspirant at the time, really introduced me to the Marianists,” Quiroz said. Following a Society of Mary summer camp that connected Quiroz with brothers and priests across the country, his mind was made up. His close friends were supportive, but it was time to tell his family. While Agosto’s spiritual calling came in college, Quiroz was exploring religious life before high school. Agosto and Brother Dennis Bautista, S.M., Ph.D., play along on a sunny afternoon out side of Casa Maria. Brother Dennis Bautista, S.M., Ph.D., Associate Professor of English and Communications Studies at St. Mary’s, knows well the challenges that secular life presents to young people considering walking away from it. Bautista had already earned a doctorate; worked his dream job teaching communications at his undergraduate alma mater, Chaminade University; and had a girlfriend before he professed perpetual vows, the last step to becoming a Marianist, in 2009. Bautista said that living and working away from home as well as having a long-distance relationship gave him time to reflect on his faith and learn more about himself. Arriving at Casa Maria as a 30-year-old aspirant in 2003, he became a Marianist brother six years later. At the ripe age of 41, Bautista is still a young gun among his peers and considers himself the “Generation Now” of Marianists. In addition to teaching and advising the student newspaper, he is responsible for every aspirant in the U.S. as the Society of Mary Aspirancy Program director, an elected position he’s held for three years. vows. Even then, daily issues don’t go away for full brothers. Using Mary as a model of faith, Marianist brothers profess four vows: poverty, chastity, obedience and stability. Bautista understands the conflicts that not only affect young men, but older ones too. When it comes to the numbers game, Father Martin Solma, S.M., Society of Mary Provincial for the U.S. and St. Mary’s University Chancellor, isn’t alarmed. Instead, he’s realistic. “Our membership has declined the last two decades, but we’ve always been relatively small,” he said. “The natural temptation is to lower our standards during the application process, but then there will be problems later on. If anything, we’ve raised our standards. Solma said World War II and the rise of the Baby Boomers directly impacted the current makeup of U.S. Marianists. While Marianists are spread across four continents and 40 countries, especially in Africa and India where communities are “growing leaps and bounds, with the average age of an Indian brother at 38 years old,” the priority has always been to educate and develop spiritual leaders, Solma said. Solma, an ordained Marianist who leads the U.S. province, said both brothers and priests can lead provinces, according to how the Society of Mary founder, The Blessed William Joseph Chaminade, structured it. While Marianists are flourishing internationally, Solma isn’t panicked about their dwindling numbers in the U.S.
Solma acknowledged societal norms have changed. “When I was a novice in the 1970s, there were 40 guys in formation with me,” he said. “I believe young people today are faced with commitment issues more than past generations, but at the same time, those who joined the Marianists back then were typically fresh out of high school. There aren’t as many young men joining the order as when he did, but those now are more intentional about their decision because they are equipped with more life experience, Solma said. Agosto and Quiroz still think about what a different path would have led to. One of those experiences is the biological kind: being a father. Despite their doubts, both men have a path set and plans for their future. 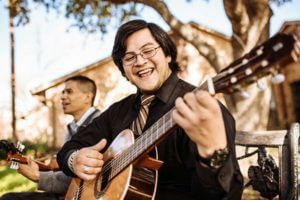 Quiroz wants to teach at a Marianist high school, and Agosto, who is currently an assistant choir director at Central Catholic High School, would like to use his vocal cords as a professional performer. As for the future of the organization they signed up for? “Given the average age of Marianists in the U.S., I don’t know how many of them we can expect on the grounds of our 18 high schools, three universities, seven parishes and four retreat centers in 10 years,” Bautista said, “but if we made joining a religious order a valid option for young people in our classrooms and in the community — young people who probably have big questions about their faith — we can inspire hope and change our outlook for the better.